An epic slice of Texas life. Let’s start with the casting. 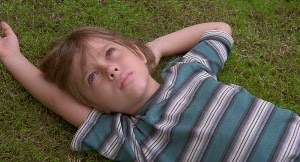 While I think it is minimizing Linklater’s accomplishments to say he got lucky, he got lucky. Mason at first was this open vessel who literally could become anybody (I certainly had no clue what type of man he would become), and the person he became (through both the writing and acting style of Coltrane) was a very relatable person. Everything that he went through became a part of who he was. He also looked the part of the son of Patricia Arquette and Ethan Hawke (particularly the latter). And thus brings me to the point of “luck”: you can’t cast a 6-year-old boy on what he will become or whom he will grow into. The beginning of the film also introduces my second favourite part of the casting. Linklater’s own daughter Lorelei Linklater plays Mason’s older sister Samantha. As the story goes, she read his script (presumably when she was 6) and found a part that she could play and demanded that he cast her. In her first scene, she’s singing “Oops!… I Did It Again” at the top of her lungs to the annoyance of her brother. As the older sister, she left her mark on Mason and left her mark on the film. The significant parts in Mason’s upbringing are his mother and father-figures. Patricia Arquette plays his struggling single mother, who does her best to take care of him but frequently finds herself at life’s mercy. Ethan Hawke plays his father, an absentee father at first, then a care-free father, and then one who realizes that he maybe he didn’t do it right the first time around. The absence of Mason Sr. leaves room for a string of alcoholic, abusive step-fathers. Their inclusion was deeply affecting, but also like Mason, you’re never sure what type of person they’re going to evolve into. They also represent Texas: Beer, football, guns and bibles: yes! Education, photography and Obama: no! The above all provide some of the more humorous moments that Mason goes through (although the step-fathers themselves are the opposite of humorous). and Mason Sr. (Ethan Hawke) in Richard Linklater’s BOYHOOD. The greatest moments of comedy come courtesy of the very genre Boyhood should be: coming-of-age. Mason’s father teaches him how to get girls (both at age 12 and age 18) and his advice was both spot-on and hilarious. But even funnier is when he attempts to give coming-of-age advice to his daughter. As Mason Sr. is trying to get the name of her boyfriend out of her, telling her not to get pregnant and advising her on how to not get pregnant, Samantha is trying to hide under the table and looks like she was dying of embarrassment. The whole theater was dying of laughter. Parents will likely have a very bitter-sweet reaction to the film as you watch real children grow up before your very eyes. I was fascinated by Mason’s growth spurts; some years he aged more rapidly than others. The influence (or even lack of influence) that the other characters would have on him was even more fascinating. The ambition of Boyhood is matched only by its success. It’s dramatic, funny, sad, touching and, quite simply, it's real life. Mud (2012) - Arkansas, a boat, a tree, two boys, girls, love, snakes and Mud.